For the Indian media and masses, Hafiz Saeed has in many ways surpassed Dawood Ibrahim as public enemy number one. Punjab Home Department has released a report stating that two Pakistanis are the next target of RAW, India’s intelligence agencies. The first gentleman, Mian Muhammad Nawaz Sharif, is known to the world as the elected Prime Minister of Pakistan. The second man, Hafiz Muhammad Saeed, is known to the world as head of Jamat-ud-Dawa (JuD) and Falah-e-Insaniat Foundation (FIF), organisations blacklisted by the United Nations Security Council Resolution 1267. JUD and FIF are also placed on the watch list of the Government of Pakistan and are affiliated with another banned organisation called Lashkar-e-Taiba. The report suggests that RAW intends to portray the planned attack on Sharif as retaliatory attacks by Laskhar-e-Jhangvi (LeJ) and Tehreek-e-Taliban Pakistan (TTP). It is interesting to note that LeJ and PML-N have had a very hostile history. LeJ has already attempted assassinating Nawaz Sharif while he was prime minister in 1999. LeJ recently also accepted responsibility of the assassination of Punjab Home Minister, Lt Col (R) Shuja Khanzada, describing it as revenge for Malik Ishaq. TTP also has a history of attacking government officials and military personnel and in view of Zarb-e-Azab they are known to get desperate and carry out the most appalling attacks conceivable. The attack on Army Public School, Peshawar, is a great indication of that. So both terror groups have a motive and history to target the Prime Minister of Pakistan. Interestingly, earlier this year in February, the National Crisis Management Cell (NCMC) of Pakistan, issued a warning to all provinces of joint attacks by LeJ and TTP. So there are legitimate reasons to believe that a nexus exists between LeJ and TTP and the two can potentially carry out an attack on the prime minister. RAW’s attempt to portray TTP as the culprit is redundant because any attack by TTP on the prime minister would automatically be deemed by our security agencies as an Indian conspiracy. In 2012, NCMC has released a circular claiming that CIA and RAW are funding TTP through Afganistan’s Riyast-i-Amoor-o-Amanat-i-Milliyah (RAAM) and National Directorate of Security (NDS) to carry out attacks in Pakistan. In relation to Hafiz Saeed, one is more inclined to think of RAW staging an assassination in view of India’s claims of JUD’s direct involvement in the Mumbai 26/11 attacks. Furthermore, Lashkar-e-Taiba, which enjoys Saeed’s support, has been engaged in violent combat against the Indian military in Jammu and Kashmir. For the Indian media and masses, Saeed has in many ways surpassed Dawood Ibrahim as public enemy number one. However, Saeed is also currently reported to be a potential target of ISIS. No direct confrontation is reported between JUD and any other banned outfit in Pakistan but Saeed has been addressing public rallies urging government to crack down on ISIS and hence is making enemies besides RAW as well. It cannot be emphasised enough that under any circumstances the security of the prime minister must be ensured specially at a stage when the country is engaged in a war against militants. The state cannot appear weak or ill prepared. An attack on the elected prime minister would be a blow to the nation’s morale. On the other hand, though it is not fitting to equate Hafiz Saeed to Nawaz Sharif, but like Sharif, Saeed is also a citizen of Pakistan. Under the laws of this country and the constitution we so claim to hold dear, force can be used against a Pakistani citizen only by the law enforcement agencies and that too on orders of the Court or the government of Pakistan. If any Pakistani deems Saeed to be a terrorist then the onus is on our judicial system to punish him rather than hope for foreign intelligence agencies to take him out. 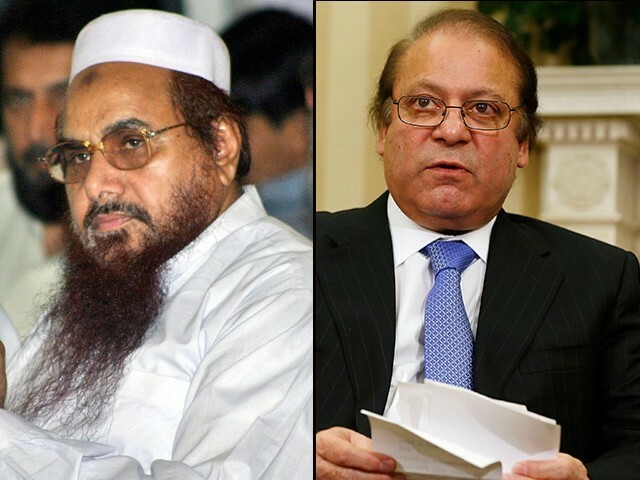 Saeed and JuD are not the only the examples of the non-implementation of the National Action Plan. Those who support public hangings and want every terrorist and sympathiser to die a painful death, need to reconsider what values they are propagating. Craving justice is not the same thing as craving blood. For me an attack on Saeed by RAW would be more condemnable than America’s violation of our airspace and sovereignty to kill Bin Laden, who was wanted in Pakistan as well and who was not a Pakistani citizen. If Bin Laden was allowed a safe house in Abbottabad then my grievances are against the Pakistani state, which has a legacy of mucking up things with flawed policies but that does not justify American interference. Though, many have claimed that Pakistan was in on it all along and the Obama administration was too selfish to share the credit for killing the world’s most wanted man. Similarly, if Hafiz Saeed is allowed to operate freely then my grievances are again against the Pakistani state but that would not justify Indian or any foreign interference at any cost. One can only hope that our law enforcement agencies can do a proper job of effectively protecting those citizens which should be protected by law, and indicting and convicting those who deserve it under the law. Agree with you on your sentiment about Pakistan’s sovereignty. Hafiz Saeed has the same rights? Of course. Why not, when non-citizen such as Osama bin Laden, Mullah Omar, Zawahiri have been given state protection and sustenance? First of all, there is no law in Pakistan. Your Supreme Court regularly uses Indian judgements. One of the judgements which was used by Pakistani Supreme Court is the Basic Structure doctrine, which is a landmark judgement by the Indian Supreme Court. This concept of Basic Structure says Contitution’s basic structure cannot be changed by anyone and any institution. No laws can be made to violate the basic structure. Last year your military and politicians basically thrashed the Pakistani supreme court’s basic structure verdict by creating Military courts. They did this by altering the Consitution, which the basic structure judgement was meant to avoid. There is no meaning for Law in Pakistan. In civilized socieities, Judicial systems interpret the Constitution and can strike down any legislation which goes against it. In Pakistan, the Army can do anything it wants to like setting up those Military courts, which is another name of Kangaroo Courts. They can use these courts to justify military take overs which happened about 15 years ago by Mushraff. But, will international terrorists like Hafiz Saeed ever be tried in these kangaroo courts? Never. How about Dawood who is hiding in Karachi? Never. The new Afghan Taliban chief residing in Pakistan? Never. If head of TTP was miraculously captured, would he be allowed to strand trial? Of course not. He would be shot dead on sight, without a trial or due process. Pakistan’s army establishment is facing increased heat from USA and India on Hafiz Saeed. Pakistan’s army establishment cannot punish Hafiz Saeed because he has so many secrets and would reveal them causing huge damage to the Establishment. So, Pakistan’s army establishment has decided to kill Hafiz Saeed and to make it palatable for Pakistanis has come up with theories on RAW targeting Hafiz Saeed and Nawas Sharif. Hafiz Saeed was unhappy with Ufa statement which the Army had cleared. He told the Army that if Kashmir is not included in discussions with India, he would not be able to prevent his cadres from joining ISIS. Pakistan’s Army gave in and forced Nawaz Sharif to retreat from Ufa joint declarations. Simultaneously Hafiz Saeed also activated Hurriyat group to hold demonstrations in India and raise Pakistan’s flag along with ISIS flag. You’re the right kind of Liberal Mr.Nasir, not like those Pakistan-bashing Tarek Fatah-type liberals who just want to erase Pakistan off the world map. RAW failed in Balochistan and will fail again IA. This is a Pakistani site, so for security reasons you might want to stay away from it. Not surprised that many Indians are completely missing the point of the author… All he is saying is that extra-judicial killings are wrong (including those staged by Pakistani police/etc) . Not a particularly controversial opinion. why u guys dont talk about state sponsored terrorism in Kashmir,Punjab and Assam. So? You guys are bombing your own people. 2 million IDPs, homeless and poor due to the actions of your Army. If countries India and US use law to justify actions then its understandable. But, Pakistan? There is a Pak Supreme Court judgement which says basic structure of Pakistani Constitution should not change, yet this was ignored and military courts were set up with a Consitutional ammendment. UN lists him as heading a notorious Terrorist outfit and having links to Al Qaeda. Modi has been tried and released without any evidence in India’s highest courts. He is NOT under trial. Then, why can’t Pakistan take action based on UN blacklisting? You are missing the point. We are not talking about Muslim- Nonmuslim killings. We are talking about one country trying to bring to book perpetrators of crime residing in another country who committed crimes in the former. India has never proven Hafiz Saeed’s hand in the Mumbai attacks. The US State Department had announced a $10 million reward under its Rewards for Justice program for anyone who can provide proof admissible in a court of law implicating him in that attack. Go to the State Department’s website and read the transcript of the daily press briefing of April 4, 2012. Spokesman Mark Toner was repeatedly pressed by journalists why the US won’t simply take the evidence needed from the Indian government, who claims it has provided all the evidence against him. He had no answer, do watch the video of that briefing and see how visibly uncomfortable Mark Toner became. Almost 4 years on, the Indian government has never provided that evidence and those $10 million are still in the State Department’s coffers. @rationalist: “A state’s sovereignty ends when it violates the sovereignty of another state.” — You mean like when India orchestrated a large-scale terrorist insurrection in East Pakistan and then invaded directly to split Pakistan in half? Would you apply your blanket categorical statement on that case too? Or is it just meant to be selectively applied on Pakistan and the same standards do not apply on India? @Anoop: You implement the UN resolutions on Kashmiri people’s self-determination and we’ll implement UN resolutions on Hafiz Saeed’s ban, deal? The Gujarat police was totally under his control, and the RSS has overrun India’s justice system. That’s why the Gujarat police deliberately made an extremely weak case to prosecute Modi with, that’s why he was acquitted on lack of evidence. Ever since he became prime minister, he has turned his vengeful wrath on the activists and police officers who made the case against him and struggled for the victims (while other court cases against Hindu terrorists are being thrown out of Indian courts too). Dude, go and read the UN Resolutions first. Pakistan is violating it first by not withdrawing troops from POK and handing it over to India. This is the first point in Part A.
I’m tired of educating Pakistanis on this issue. Read the darn document which you guys talk about it so much. Its just 1 page. I can’t really blame you, seems like your own PM haven’t read it.